Free crochet patterns to stitch until your heart's content! Crochet is one of the most versatile crafts, and you don't need a room full of tools to enjoy it. Really, all you need are a crochet pattern, the right size hook, and the correct weight of yarn. It's as simple as that. Here at Free-crochet.com, we can help with one of those items -- actually hundreds! 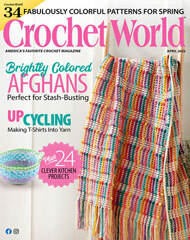 Download hundreds of free crochet patterns in a variety of skill levels and styles. Get everything from free crochet doily and scarf patterns to larger projects like crochet afghans, tablecloths and table runners and more! You're invited to explore our collection, sign up for a free membership and download as many crochet patterns as you like. Beginner? Learn how to crochet with our help! Crochet is simple to learn, and here at Free-crochet.com, we make it even easier. If you're working a free crochet pattern and come across a term you don't understand, chances are our Crochet Glossary will give you the explanation you need.